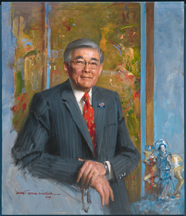 Congratulations to former Congressman and cabinet secretary Norman Mineta, who is now part of the permanent collection at the National Portrait Gallery in Washington, DC.Mineta was a pioneer and part of the first wave of Asian Americans politicians to make an impact on our country. He served in Congress from 1975-1995, co-founded the Congressional Asian Pacific Caucus and helped push through the Civil Liberties Act of 1988, which called for an official apology and redress for Japanese Americans interned during World War II. Mineta, along with his family, were interned during the war. Mineta was also the first Asian American to hold a presidential cabinet post. He was named commerce secretary by Bill Clinton in 2000 and served as transportation secretary under George W. Bush until resigning in 2006. It’s almost commonplace in many areas of the country to have Asian Americans in government, and it was Mineta and others of his generation who opened the doors. For that we owe them thanks.